Shortly after we recalled Bruce Springsteen's rock-and-roll down an Oak Cliff bowling alley -- almost moments after -- news broke that Clarence Clemons had died from complications caused by a stroke suffered a few days earlier. At which point I cued up the '84 Reunion stop and remembered-when yet again. Then, only yesterday, I came across this: Bruce and the E Street Band at the Dallas Convention Center on July 12, 1978 (scroll down). And I thought: Well, there's a good Independence Day item. If only he'd performed "Independence Day." I'd read a little about this show in this sneak peek at the book Pete pointed out back in '09. And here, one concertgoer recalls the show being moved, last second, from the Dallas Convention Center Arena to the much smaller theater next door, which held maybe a couple thou: "What a treat! I was in the 3rd row center, and it was like having a concert in my living room!" Springsteen, who'd had trouble selling Dallas before, even comes out and acknowledges the switcheroo before the show's open, coming out to calm the restless crowd ("We switched halls, thanks for being so patient") some 15 minutes before kicking off with a scorching "Badlands." This, right here, is when all it turned epic -- when Springsteen and the band graduated from the small rooms to the arenas, when the shows began to stretch to marathon lengths, when the promise begat "The Promise" and Springsteen had just released his masterpiece. 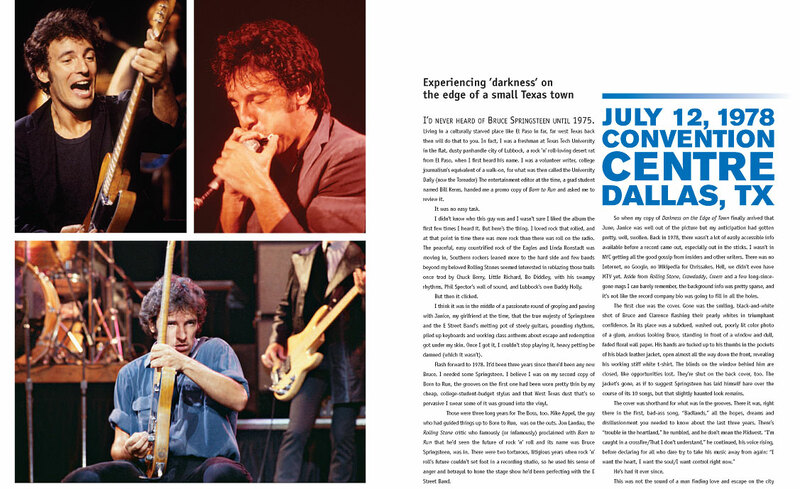 (Imagine seeing Springsteen just one month after the release of Darkness on the Edge of Town.) Some of the songs here stretch for days and still don't feel long enough; those versions of "Jungleland" and "Backstreets" could go forever. He dedicates "Fire" to the Dallas Cowboys, intros "The Promised Land" by complaining about the heat ("I don't know how you guys take the heat down here in the summertime") and covers a Texan too -- Buddy Holly's "Not Fade Away," available here separately. Helluva fireworks show.